Hello new friend of RoboBrrd! Congrats on your new RoboBrrd Kit! This set of webpages will guide you in how to build one. There are three main steps: building the chassis, assembling the RoboBrrd Brain Board, and programming RoboBrrd. 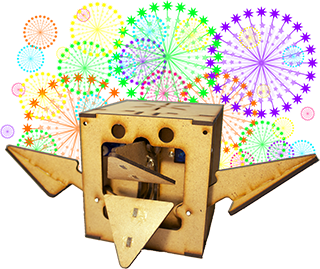 You can be as creative with RoboBrrd as you want! We check our kits thoroughly before they are shipped out. If there is something to your dissatisfaction, please let us know by emailing erin@robobrrd.com. Note: you will need a FTDI cable to program the RoboBrrd Brain Board. We recommend the FTDI Friend or FTDI cable. The first step is to start assembling the chassis of RoboBrrd, you can get started here! "I'm starting to build my RoboBrrd robot! w00t w00t!" Even more soldering on the Brain Board! The last part of soldering, and you will be able to power up your board and see the pin 13 LED blinking! RoboBrrd has lots of extras, like the LED eyes and sensors. Let's start soldering them together and adding them to RoboBrrd!